One part BY 6060. Two parts CS 2000. Equal pinches of Nex 1022 and BY 6074. This fancy cocktail of canola hybrids just might perform better than planting only one of the hybrids in a field. Greg Stamp of Stamp Seeds in Enchant, Alta., ran demonstration trials in 2016 and 2017 to see if a blend of hybrids would perform better. A composite blend of multiple hybrids provided varying results. One part BY 6060. Two parts CS 2000. Equal pinches of Nex 1022 and BY 6074. 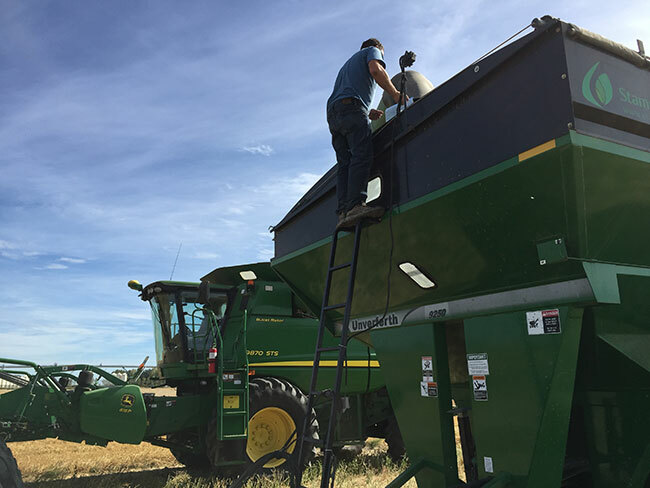 In 2016, a blend of six different canola hybrids averaged seven per cent higher yield than the plot average and five per cent higher than the highest yielding single variety. The varieties were a mix of medium and long-term varieties, and because seed size was different, Stamp averaged the thousand kernel weights to come up with a seeding rate to target his plant population. In 2017, the blended hybrids averaged the same yield as the overall plot average, but less than three of the five single hybrids. The idea of mixing different varieties together isn’t new. Called a “composite” cultivar, it was common practice in Europe, especially Germany, and was even done in Canada. A genotype by interaction effect plays a role in potential higher yield. Some hybrids might do better under one type of climatic condition and a different hybrid might perform differently under another climatic condition. With a mixture, some of the genotypes may be able to produce a higher yield to compensate for the lower yielding ones. Stamp says this environmental interaction could have contributed to the differences between 2016 and 2017 outcomes. Although the trials in both years were planted under irrigation, the summer of 2017 was much hotter than 2016. “Maybe some years a mixture could flower longer and take advantage of the longer growing season. Maybe in 2017 the mixture couldn’t take the heat blast at flowering as well as some of the individual hybrids did,” Stamp says. The practice of registering composite cultivars is no longer acceptable in Canada. The introduction of Plant Breeders’ Rights Act meant Canadian plant breeders could no longer mix varieties together because a variety has to be clearly defined rather than a mixture of genotypes. A composite blend of multiple hybrids provided varying results. With a mixture of maturities, the uneven growth resulted in a few challenges. Stamp says fungicide application timing is more difficult to target. 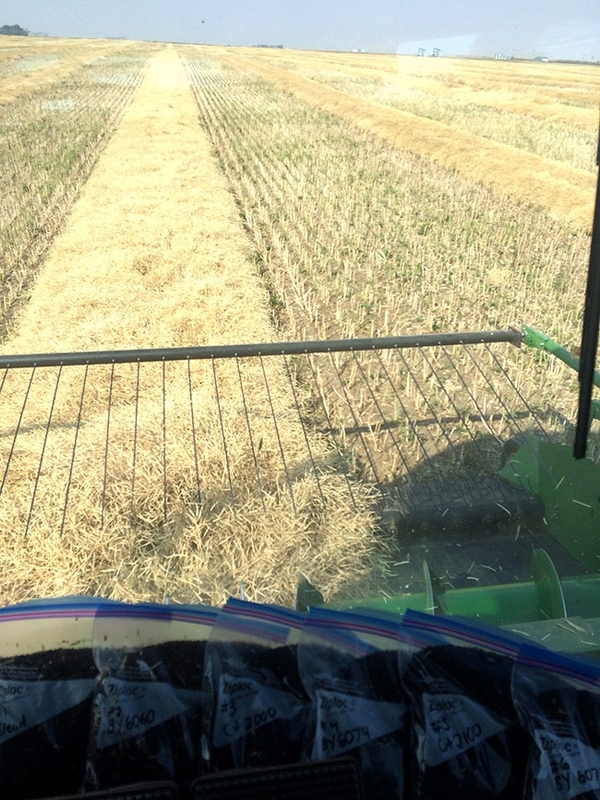 Uneven maturity also made swath timing more difficult. In 2016, the blend was also more difficult to swath, although Stamp isn’t sure why – perhaps more branching and tangling of the stems. The trials are demonstration plots and not randomized, so drawing conclusions is difficult. However, the “composite” approach might make sense from a risk management perspective. Some hybrids do better than others in different years. Blending a few hybrids together might help compensate for years when some perform poorly and the other pick up the slack. Alternatively, Stamp says maybe growers could look at seeding more than one hybrid on all their canola acres. For example, grow four different hybrids on four different fields. If one doesn’t perform, the others could compensate as a hedge against the weather.